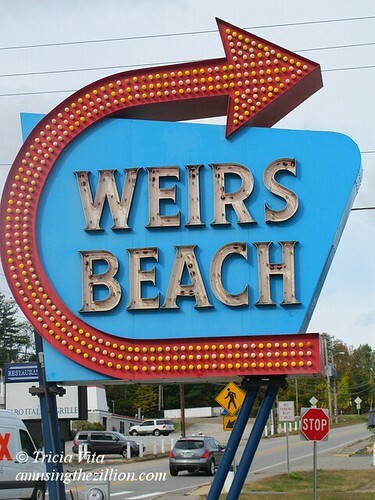 A recent trip to New Hampshire took us to Weirs Beach, a summer resort on Lake Winnepesaukee that is also home to Funspot, named “The World’s Largest Arcade” by Guinness World Records. The indoor fun mecca was founded more than 60 years ago by Bob Lawton, who at 84 years young still runs the place, which is open year-round. 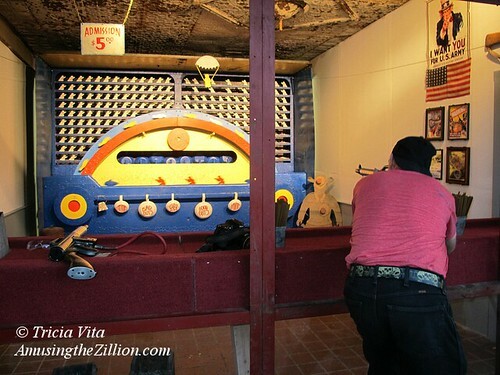 While kids rode coin-op carousel horses and pint-sized bumper cars and families bowled and played the Famous Landmarks of New Hampshire-themed mini-golf in the 75,000 square-foot fun center, we trooped upstairs to meet Hercules, the World’s Largest Pinball Machine. Manufactured by Atari in 1970, the giant size machine uses a cue ball as a pinball and dwarfs its neighbor, a 1938 Genco Stop & Go. 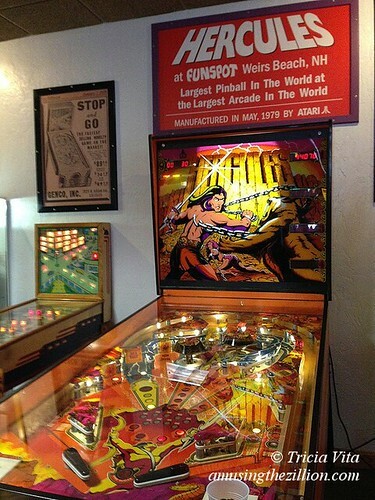 Hercules is stationed at the entrance to the American Classic Arcade Museum (ACAM), which museum curator Gary Vincent describes as “like stepping into the Wayback Machine.” ACAM has over 200 classic video games as well as a selection of pinball machines, any of which can be played for a few tokens. Four tokens cost $1.00; we splurged on 100 for $20. Among the rare video games you can play are Computer Space (1971), the world’s first commercially available coin-operated video game. Developed by Nolan Bushnell and Ted Dabney, who would go on to found Atari, th mod looking machine has a fiberglass cabinet with sparkle gel coat. “It actually has a television set in it that has been modified to run with video game hardware, which is typical of video games until about 1974,” Vincent explains. 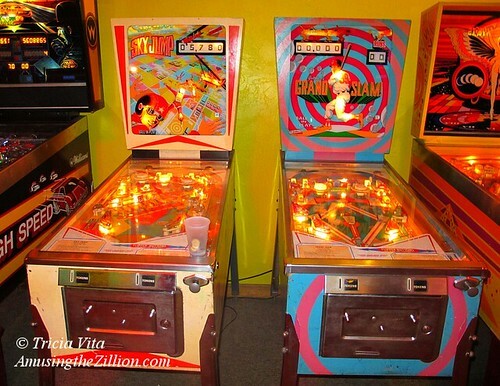 Among the electro-mechanical pinball games that we got to play were Gottlieb’s 1972 Grand Slam, a baseball game of which only 3,600 were manufactured, Sky Jump (1974) and Devil’s Dare (1982), and Bally’s Mr. and Mrs. Pac Man Pinball (1982). Rare video games include Star Trek: Strategic Operations Simulator (Sega, 1983), Cloak & Dagger (Atari, 1983), and Death Race (Exidy, 1976). The museum’s 501-c3 status lets it to run weekly bingo games as fundraisers, allowing it to buy more classics, fix them up and put them on the floor. Luminaries from the video game community such as Curt Vendell of the Atari Museum, and Robert Mruczek, the former chief referee of Twin Galaxies, have donated a number of games from their personal collections. As we were about to leave, it was a great pleasure to meet Funspot’s founder Mr. Lawton. We talked arcades and exchanged business cards. His card entitles the visitor to $20 worth of free tokens and is tucked away in the glove compartment in anticipation of our next trip to New Hampshire. 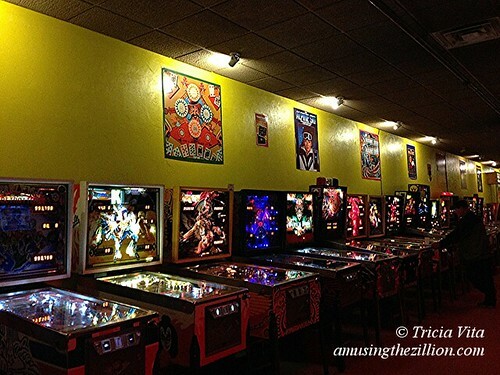 Pinball is back in Coney. 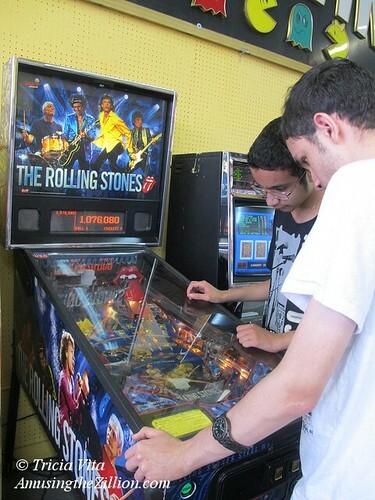 It’s only one table–the Rolling Stones (Stern 2011)– but most New York bars with pinball machines have one or two, according to the New York City Pinball Map. The location is Margarita Island, the newly opened bar at 1205 Bowery that is the successor to Beer Island. There’s a Boxer and a few other arcade machines in the indoor bar adjacent to the patio. 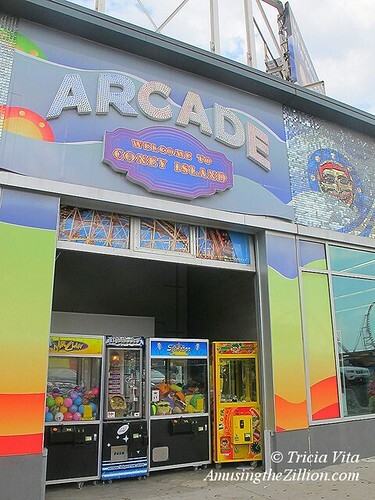 Coney Island has arcades with redemption games galore–The Eldorado on the Bowery, under Deno’s Wonder Wheel, and at Luna Park–but no pinball. Back in 2011, Ruby’s and the Freak Bar each had one table, and Carl Muraco’s Game World on Surf Avenue had two. All were destroyed by Sandy. At the Alliance for Coney Island Gala last Thursday, ATZ stopped by Thor Equities’ table to network. Seriously, it was a great opportunity to find out the answer to a question that’s been on our mind since last season. 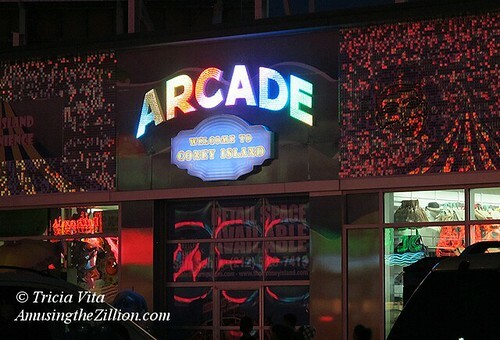 Will there be arcade machines in Thor’s retail building this year? The building has gorgeously lit, expensive signage for two arcades where there’s nothing but “Retail Space for Lease” signs. As we’ve noted previously, it makes a mockery of the City’s 2009 rezoning requiring a percentage of amusements on the property. 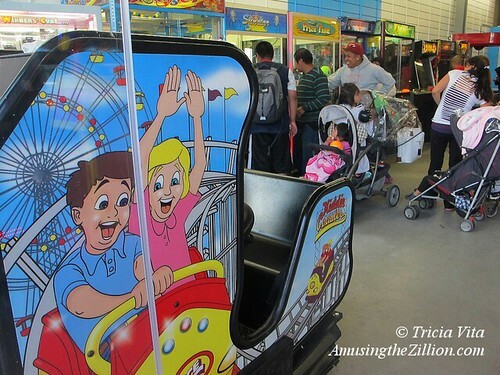 The dummy arcades are our pet peeve. Good news! Glenn Vogel, Director of Leasing for Thor Equities told ATZ that one of the two arcades had been leased and will open for business this spring. The reason the arcades were not previously leased, despite many inquiries, was that Thor wanted to put something new and different in the space, Vogel explained. We promised to be the first one there to play on the arcade’s opening day! The other piece of news that Vogel was able to confirm is the rumor that’s been floating around Coney Island that BurgerFi is coming to the Stillwell Avenue side of Thor’s building. The Delray Beach, Florida-based burger and hot dog chain has reportedly leased the vacant store between Brooklyn Rock and the Brooklyn Nets, which will put them right across the street from Nathan’s and around the corner from a Johnny Rockets. Thor’s building’s roof deck, which hasn’t been used with the exception of a private party last summer, is part of the deal. Our natural burgers are a healthful, wholesome and guilt free indulgence made from fresh, never frozen natural Angus beef that is hormone and antibiotic free and raised humanly to create the best tasting burger possible. All beef dogs, real dairy fresh frozen custard and fresh cut fries, as well as craft beer and wine, are all served up in our urban hip design setting. 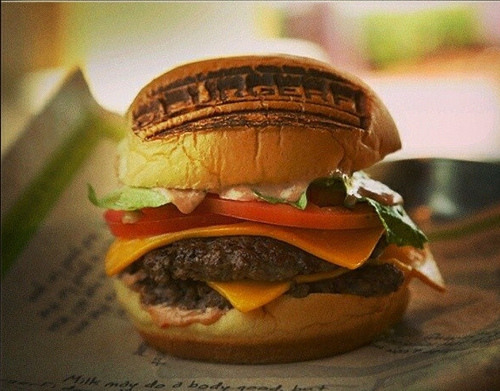 BurgerFi is the latest national chain to come to the new Coney Island. Back in 2012, ATZ asked “Will Coney Island’s Surf Ave Become a Mecca for Franchises?” (December 19, 2012). Clearly, the answer is yes. Like attracts like. In 2014, Johnny Rockets, Red Mango, Rita’s Italian Ice and Subway Cafe, which are currently under construction, are expected to join It’Sugar, Applebee’s, Popeye’s, Dunkin’ Donuts/Baskin Robbins and Subway on the main drag of Coney’s amusement district. Also on Surf and in a category unto themselves are Nathan’s original 1916 store, which is a year-round magnet for tourists, and Brooklyn-grown Grimaldi’s Pizzeria. 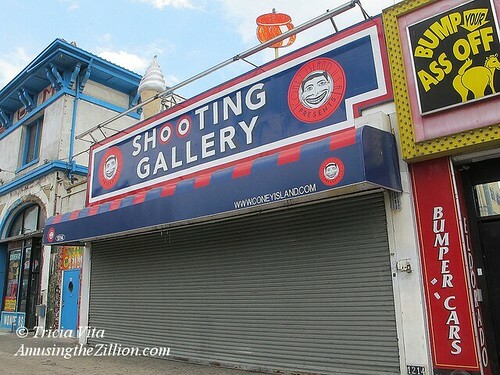 For the past two weeks, the Coney Island Rumor Mill has been abuzz with the rumor that Thor Equities-owned Grashorn Building, Coney Island’s oldest structure, is set to be demolished. Though you’d never guess to look at it today, the building dates back to the 1880s and predates Coney’s first amusement parks, which were built in the 1890s. We can’t confirm the rumor, there’s no demolition order for 1104 Surf on the DOB’s website. Thankfully. Not yet. But we’d be remiss not to mention it. In the past, there’s been a lag on updates to the DOB site when for example, Thor’s teardown of the Henderson Music Hall at the end of the 2010 season caught people by surprise as the asbestos abatement that preceded the demo got underway. The Grashorn rumor started as Gameworld moved out of their Surf Avenue storefront, where the arcade had relocated the year after losing their spot in the then soon-to-be demolished Henderson Building. Known as Faber’s Fascination because of the vintage bare bulb sign from the earlier Fascination parlor, the Henderson arcade was one of the few businesses open year round in Coney Island’s amusement district. 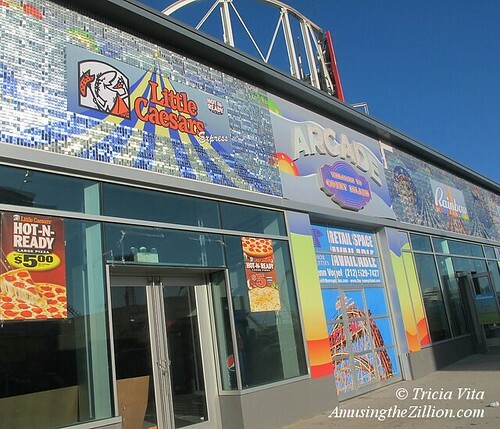 Not only are there no year-round arcades in Coney Island today, there are signs on Thor’s new building touting “ARCADE” where there is nothing but retail space for rent. After auctioning off some of the Gameworld arcade machines, owner Carl Muraco moved the rest to a newly leased space on the Bowery. 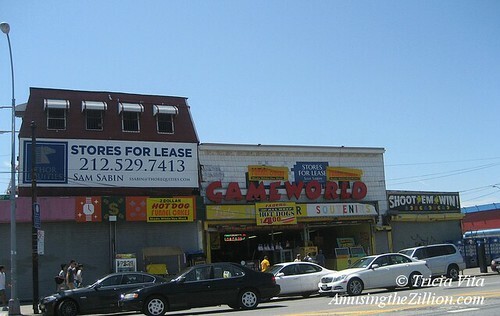 Owned by Jeff Persily, the location is next-door to the lot where Coney Island Arcade was before it burned down in 2010. Gameworld is expected to reopen next season. The Jones Walk side of the Grashorn building has been vacant since 2008, as ATZ reported in “The New Coney Island: A Tale of Two Jones Walks.” In the summer of 2010, Save Coney Island published renderings showing the potential of the building if restored, but their plan to create a Coney Island Historic District along Surf Avenue was crushed by Sitt’s demolition of all but one of his historic buildings. Only the Grashorn remains. Originally Henry Grashorn’s hardware store, the Grashorn building later housed shooting galleries, arcades, and cotton candy and taffy stands. 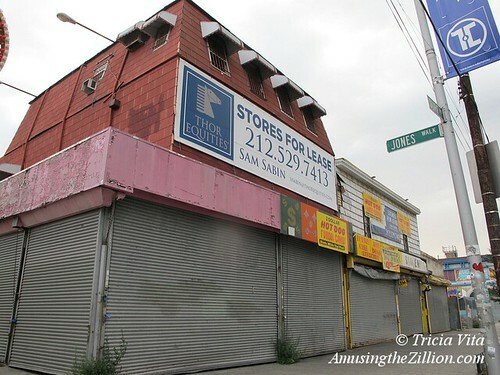 Considered too “altered” to win landmark protection by the City’s Landmarks Preservation Commission, the vacant, deteriorating building has been a victim of the continuing decimation of the amusement area by Thor CEO Joe Sitt. 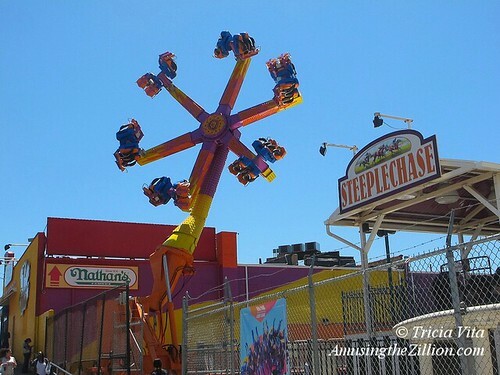 It may not survive in the New Coney Island. Demolition by neglect?